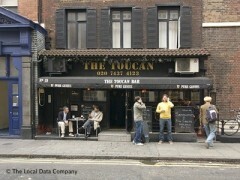 About: The Toucan is an independent pub that serves a variety of traditional Irish and Celtic dishes. They also provide a range of extras including satellite TV and live music. It’s painted black like a pint of Guinness for goodness sake, it has to be one of the best Irish pubs in London, right? Riiight?! And yes it is. Located just off of Soho Square, The Toucan does an impressive Irish stew, serves an excellent pint of the black stuff and keeps a huge stock of those legendary Guinness hats behind the bar. And that’s enough in our opinion. "they do a tasty stew but it’s still just a dingy old pub"
Irish bars all over London are crying into their pints at the mention of the Toucan, and it’s hard to blame them for getting so upset by the cheek of it all. Get pub. Cover it in adverts of Guinness’ illustrious past. Watch the cash roll in. But don’t blubber all you O’Neill’s out there, they might serve a good pint, the whiskeys are good and they do a tasty stew but it’s still just a dingy old pub. For some that dinginess is the allure of it and that’s fair enough, a pub’s a pub and there is a certain attractive deviousness to the darkness here but for all the traffic it gets you’d think there was more going on than a lick of red paint and a bunch of stools shaped like pints of Guinness. But, little Soho streets are prime for pavement drinking and that’s where this sits, hogging up a location that attracts the big numbers after work. There are some lagers as well and the list of rare Irish whiskeys is impressive but it doesn’t feel like much more than your average local and you probably shouldn’t be fooled by the nurtured black and white façade that’s just like another advert- next they’ll be telling you it’s good for you! Pah!